Join Us!!! We are looking for someone to help us cover Nigerien basketball. Please send us an e-mail. Saint-Quentin Basket-Ball (ProB) added to their roster 27-year old Nigerien center Roger Aboubakar Zaki (214-88, agency: Fusion Sports). He played last season at Lille Metropole Basket (ProB). In 27 games he had 4.4ppg and 2.6rpg. 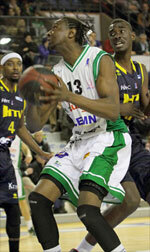 The previous (13-14) season Aboubakar Zaki played at ESSM Le Portel Cote d'Opale. In 47 games he recorded 4.4ppg and 2.7rpg in 2013-14 season. His team made it to the French Cup final in 2009. Aboubakar Zaki has played previously for four other France teams: Gravelines-Dunkerque, Sluc Nancy, Denain Voltaire and SO Maritime Boulogne. On Aboubakar Zaki: A great project at center postion. Has great size and an excellent wingspan, can be an intersting shot-blocking presence when he puts his mind to it. Has lot of things to improve yet, but for a guy who started playing organnized basketball only 3 years from now, he's ina a very good stage. KK Gostivar (Prva Liga) inked 24-year old American (has also Nigerien passport) swingman Tanksley Efianayi (198-95kg-94, college: Cent.Florida). He played recently at Balkan in Bulgarian NBL league, but left the team earlier this month. In 12 games he recorded 8.9ppg, 2.9rpg, 1.4apg and 1.1spg this season. Efianayi also played 10 games in FIBA Europe Cup where he averaged 8.8ppg, 2.5rpg, 2.1apg and 1.0spg. 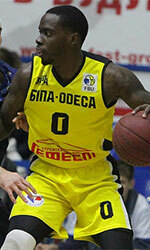 The last season he played at BC Odessa (Superleague) in league. In 30 games he had 12.3ppg, 5.0rpg, 1.6apg and 1.4spg (in top 5). A very good season in his career as he was voted to Eurobasket.com All-Ukrainian Superleague Honorable Mention, All-Star Game and All-Imports Team. Among other achievements Efianayi's team made it to the AAC Tournament Semifinals in 2017. He received also All-Mid-Florida Conference Player of the Year award and All-Mid-Florida Conference 1st Team award back in 2014 and 2015 at his college time. Efianayi graduated from University of Central Florida in 2017 and it is his second season in pro basketball. Balkan Botevgrad (NBL) inked 24-year old American (has also Nigerien nationality) swingman Tanksley Efianayi (198-95kg-94, college: Cent.Florida). He played most recently at BIPA Odessa in the Ukrainian Superleague. In 30 games there last season he recorded 12.3ppg, 5.0rpg, 1.6apg and 1.4spg (in top 5). A very good rookie year in his professional career, as he was voted to Eurobasket.com All-Ukrainian Superleague Honorable Mention, All-Star Game and All-Imports Team. Efianayi graduated from University of Central Florida in 2017 and it will be his second season in pro basketball. Efianayi's team made it to the AAC Tournament Semifinals in 2017. He also received the All-Mid-Florida Conference Player of the Year award and was All-Mid-Florida Conference 1st Team in 2014 and 2015. SO Maritime Boulogne (ProB) inked 29-year old Nigerien center Amadou Aboubakar Zaki (214-118kg-88). It is actually his comeback to SO Maritime Boulogne as he has played here before. Aboubakar Zaki moved there from Svendborg Rabbits in Danish Ligaen where he played this season. In 33 games he recorded 7.0ppg and 4.8rpg. The last season Aboubakar Zaki was tested by Saint Quentin. His team made it to the French Cup final in 2009. Aboubakar Zaki has played previously for five other French teams: Gravelines Dunkerque, Sluc Nancy, Denain Voltaire, Le Portel and Lille Metropole. His game is described as: A great project at center postion. Has great size and an excellent wingspan, can be an intersting shot-blocking presence when he puts his mind to it. Has lot of things to improve yet, but for a guy who started playing organnized basketball only 3 years from now, he's ina a very good stage.